Save the Date MagnetWe ordered our save the dates and we are truly ecstatic as to how nice they turned out. The magnets are of superior quality and it is great that templates are customizable to fit with the picture chosen and can be edited to your liking. Not only were we floored with how great the magnets were, New and Blue’s customer service was so easy and delightful to communicate with. Any questions or minor edits we wanted to make, were addresses and executed as asked. We truly could not be happier and we will definitely order other products from here. Highly recommend! I ordered 145 magnets and they turned out amazing! They even sent 2 extra envelopes Incase of mess ups! Very pleased with my order! Incredible!Not only is this save the date beautiful, but the customer service from New & Blue has been incredible! From ordering Samples, editing my design, to ordering a printed proof to processing my full order, New & Blue has been amazing! 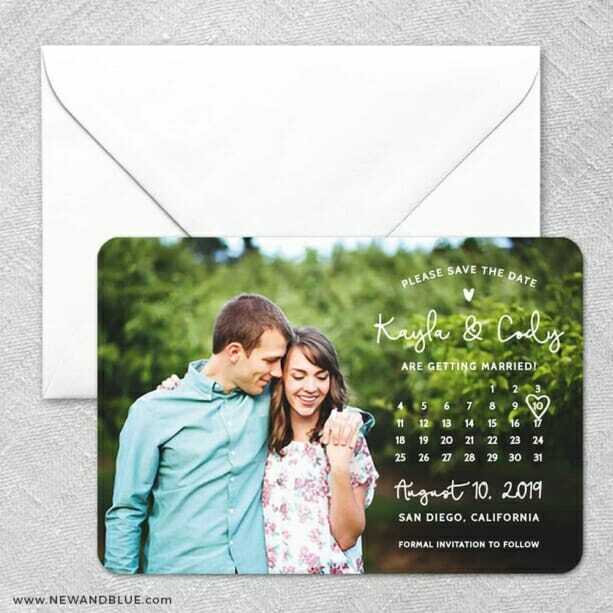 Great Quality for Reasonable PriceI ordered these Save the Date magnets after extensive research via Google and I am completely satisfied with my order! Not only are the magnets beautiful and great quality, but I found the entire ordering process to be a breeze. I greatly valued the ability to design my own Save to Date with ease. The site was very user friendly. I would recommend to anyone looking for great quality at a reasonable price. Amazing!! !If I could give them 10 stars I would! I had ordered two other sets of save the dates from two other companies and they arrived to me in very poor quality. I thankfully stumbled accross New and Blue and I am so glad I did! I received my order today, and they are amazing!!! Amazing customer serivice, they communicate with you during the entire process. If you want and amazing product with amazing quality, then order from New and Blue. You can’t go wrong! Save the Date magnetI used this template for my save the date and they turned out great!! New and Blue was very helpful when I was indecisive about what picture I wanted to use! They let me design different templates and sent me hard copies so I could decide! They are also super fast at getting this done which I loved! I will definitely be using them again!